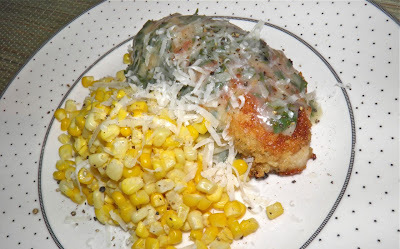 The lemon sauce paired with sweet corn was perfect! I tend to agree with that. What makes me happy is I even got mine on sale!! Turkey is actually quite special, and it most certainly shouldn’t be relegated only to the Thanksgiving table, as many of us do. The problem is that when most people think of turkey they think of a whole bird. The bound breading has parmesan cheese in it. A whole turkey can be a daunting beast, but it’s no more difficult to deal with than a chicken. But you also can purchase turkey legs, breasts or thighs. Often only one breast (or a couple thighs) is enough to feed four people. Turkey is not chicken, of that be sure. It has more robust flavour than chicken and it’s really very good for you. Part of the inspiration for this recipe was my bag of lemons I bought last week. I’m still going through them and am bound and determined to use them up. I can imagine more lemon-based recipes will be written about in the days to come. This was an excellent way to serve turkey. Slightly tart with hints of white wine. The Italian parsley and parmesan tie it all together. Give this a try. It won’t disappoint! Cut the turkey breast into four equal pieces. You will probably have to slice the thickest part in two before dividing into the serving pieces. It is important they’re all about the same thickness so they cook in the same length of time. Preheat the oven to 400°F. Heat the 1 tbsp of butter and oil in an oven proof frying pan. Grate the bread and cheese into a plastic bag (it works best and is cheapest). Mix the flour, salt, pepper and nutmeg into the grated bread with your fingers. Combine the egg and milk on a plate and whisk with a fork until the egg is broken up and the milk is mixed in. Dip each piece of turkey in the egg and then shake in the bread coating. 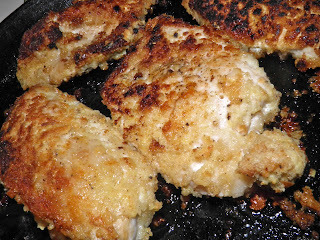 Place the breaded cutlet in the hot pan. Repeat until all the turkey is breaded. Brown the cutlets on each side. Then place the pan in the hot oven for between 20-25 minutes. Check for doneness with a meat thermometer. The internal temperature must reach 180°F. Remove and let rest for a few minutes before serving. To make the lemon sauce, melt the remaining 1/4 cup butter in a small saucepan. Sprinkle the flour on top and whisk until smooth. Place over the heat and let cook until bubbly. Then add the white wine and whisk until thickened. Squeeze the lemon juice and pour into the sauce. Whisk until smooth and then whisk in the Dijon. Chop the Italian parsley and stir into the hot sauce. taste for salt and add some id desired. 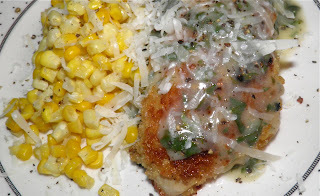 Serve over the chicken cutlets with some grated parmesan on top.